As an Australian, I both know nothing about and care to know nothing about soccer, or as the rest of the world calls it ‘football’. 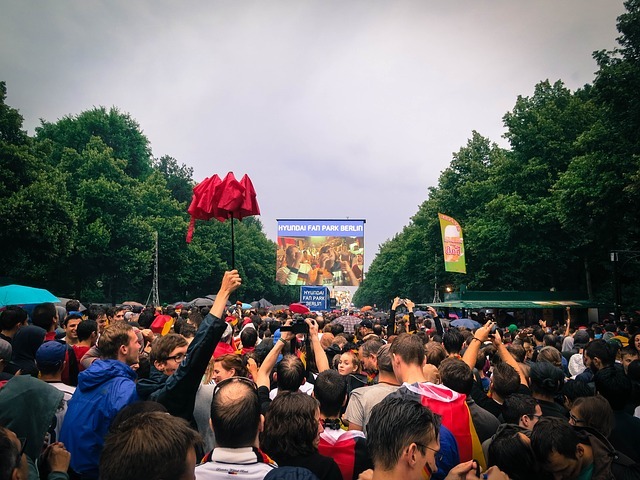 So last week, when the phenomenon of the UEFA 2016 Euro Cup arrived on my doorstep, I was shocked to see the usually un-sporty city of Berlin transform into a team-scarf-wearing, flat-screen-watching, street-singing bunch of fair-weather football fans. Naturally, I had to to see what all of the fuss was about. And whilst I still think soccer inspires greater levels of boredom than late night darts on TV, and simultaneously requires about as much physical endurance as late night snooker on TV, I can’t help but succumb to the enjoyable street culture surrounding this otherwise uninteresting, month long event. As Späti’s and restaurants with outdoor seating turn into living rooms with large TV screens, crowds of people respond by flocking to the pavement, huddling around, yelling passionately and, more importantly, consuming from these establishments. As I walk by a local Thai-Vietnamese-Japanese fusion restaurant, the normally depressingly empty tables are instead filled with spectators happily eating their ramen/pad thai/phô. And further down the road the neighbouring Späti and Döner shop have combined forces providing drinks and food to each other’s guests. In workplaces across the continent, national rivalry strikes through Kicktipp competitions and jovial contests as the quiet guy in accounts unexpectedly finds his calling. Afternoon meetings make way for office viewing parties and flexible working locations, from beach bars to the banks of the Spree and every possible open space that can accommodate a projector screen. In the evenings, murmurs of distant cheering and loud echo’s of sports commentating fill the streets, crescendoing as the game progresses to half time and then full time, leaving no question about the score or lack thereof at the end of the match. Whilst I look forward to the end of this foreign, typically un-Berlin event that leaves supermarket lines quiet between 7pm and 9pm and seats in non-participating bars free for me and my friends, I will miss the fun, calm air of comradely society (minus the English and Russian fans in France) that has infected our streets here in Berlin. At least for four more years. To participate in the action, simply visit your local Späti, Vietnamese restaurant or café-restaurant-bar.